tunableSurface lets you parameterize and tune gain schedules, which are gains that vary as a function of one or more scheduling variables. σ is a vector of scheduling variables. n(σ) is a normalization function (see the Normalization property of the output argument K). γ is a scaling factor (see the Normalization property of the output argument K). F1,...,FM are user-selected basis functions. You can use terms in a generic polynomial expansion as basis functions. Or, when the expected shape of K(σ) is known, you can use more specific functions. You can then use systune to tune the coefficients K0,...,KM, subject to your design requirements, over the range of scheduling-variable values. The tunable surface K stores the basis functions specified by shapefcn and a discrete set of σ values (the design points) given by domain. The tunable gain surface has tunable coefficients K0,...,KM. 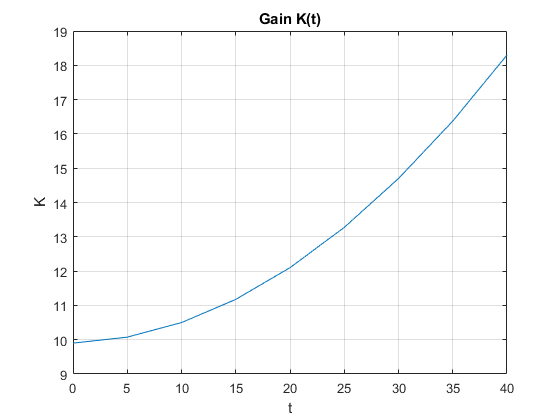 The gain value is initialized to the constant gain K0init. You can combine K with other static or dynamic elements to construct a closed-loop model of your gain-scheduled control system. Or, use K to parameterize a lookup table in an slTuner interface to a Simulink® model. Then, use systune to tune K0,...,KM so that the closed-loop system meets your design requirements at the selected design points. K = tunableSurface(name,K0init,domain) creates a flat surface with constant, tunable gain. This syntax is equivalent to tunableGain(name,K0init). This gain surface can represent a gain that varies with time. The coefficients K0, K1, and K2 are the tunable parameters of this time-varying gain. For this example, suppose that t varies from 0 to 40. In that case, the normalization function is n(t)=(t-20)/20. Specify a quadratic function for the variable gain. shapefcn is the handle to an anonymous vector function. Each entry in the vector gives a term in the polynomial expansion that describes the variable gain. tunableSurface implicitly assumes the constant function f0(t)=1, so it need not be included in shapefcn. Create the tunable gain surface K(t). The display summarizes the characteristics of the gain surface, including the design points and the basis functions. Examine the properties of K.
The Coefficients property of the tunable surface is the array of tunable coefficients, [K0,K1,K2], stored as an array-valued realp block. You can now use the tunable surface in a control system model. For tuning in MATLAB, interconnect K with other control system elements just as you would use a Control Design Block to create a tunable control system model. For tuning in Simulink®, use setBlockParam to make K the parameterization of a tunable block in an slTuner interface. When you tune the model or slTuner interface using systune, the resulting model or interface contains tuned values for the coefficients K0, K1, and K2. After you tune the coefficients, you can view the shape of the resulting gain curve using the viewSurf command. For this example, instead of tuning, manually set the coefficients to non-zero values. View the resulting gain as a function of time. viewSurf displays the gain as a function of the scheduling variable, for the range of scheduling-variable values specified by domain and stored in the SamplingGrid property of the gain surface. where are the tunable parameters. Create a grid of design points, , that are linearly spaced in and V. These design points are the scheduling-variable values used for tuning the gain-surface coefficients. They must correspond to parameter values at which you have sampled the plant. These arrays, alpha and V, represent the independent variation of the two scheduling variables, each across its full range. Put them into a structure to define the design points for the tunable surface. Create the basis functions that describe the bilinear expansion. Create the tunable gain surface. You can use the tunable surface as the parameterization for a lookup table block or a MATLAB Function block in a Simulink model. Or, use model interconnection commands to incorporate it as a tunable element in a control system modeled in MATLAB. After you tune the coefficients, you can examine the resulting gain surface using the viewSurf command. For this example, instead of tuning, manually set the coefficients to non-zero values and view the resulting gain. viewSurf displays the gain surface as a function of the scheduling variables, for the ranges of values specified by domain and stored in the SamplingGrid property of the gain surface. Suppose that the values of interest of the scheduling variables are the following (α,β) pairs. Specify the (α,β) sample values as vectors. 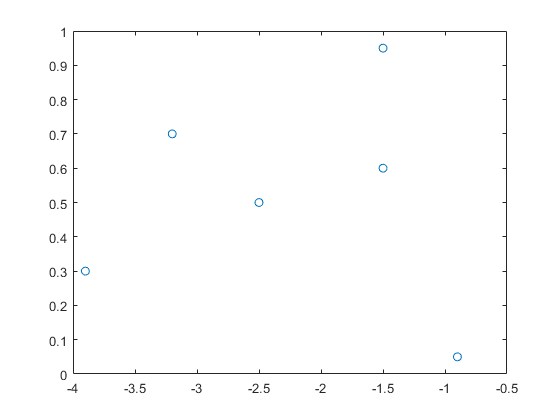 Instead of a regular grid of (α,β) values, here the system is sampled at irregularly spaced points on (α,β)-space. Create the tunable model of the gain surface using these sampled function values. The domain is the list of six (α,β) pairs. The normalization, by default, shifts α and β so that the center of the range of each variable is zero, and scales them so that they range from -1 to 1. Create a tunable gain surface that takes two scheduling variables and returns a 3-by-3 gain matrix. Each entry in the gain matrix is an independent function of the two scheduling variables. Create a grid of design points (alpha,V). Create the basis function that describes how the surface varies with the scheduling variables. 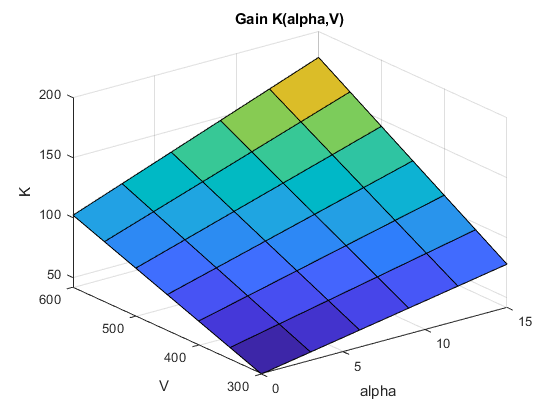 Use a basis that describes a bilinear expansion in alpha and V.
To create the tunable surface, specify the initial value of the matrix-valued gain surface. This value sets the value of the gain surface when the normalized scheduling variables are both zero. tunableSurface takes the dimensions of the gain surface from the initial value you specify. Thus, to create a 3-by-3 gain matrix, use a 3-by-3 initial value. Identifying label for the tunable gain surface, specified as a character vector. tunableSurface uses this name for the realp block that represents the tunable coefficients of the surface. Therefore, you can use this name to refer to the tunable gain coefficients within a genss model of a control system or an slTuner interface. Initial value of the constant term in the tunable gain surface, specified as a scalar or an array. 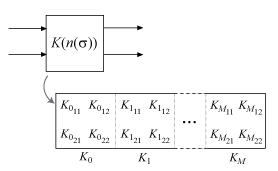 The dimensions of K0init determine the I/O dimensions of the gain surface. For example, if the gain surface represents a two-input, two-output gain, you can set K0init = ones(2). The remaining coefficients K1,K2,... always have the same size as K0. The tunable coefficients automatically expand so that the gains in each I/O channel are tuned independently. For example, for a two-input, two-output surface, there is a set of expansion coefficients for each entry in the gain matrix. The design points do not have to lie on a rectangular or regularly spaced grid (see Gain Surface Over Nonregular Grid). However, for best results use design points that cover the full range of operating conditions. Since tuning only considers these design points, the validity of the tuned gain schedule is questionable at operating conditions far from the design points. Basis functions used to model the gain surface in terms of the scheduling variables, specified as a function handle. The function associated with the handle takes normalized values of the scheduling variables as inputs and returns a vector of basis-function values. The basis functions always operate on the normalized range [–1,1]. tunableSurface implicitly normalizes the scheduling variables to this interval. shapefcn is an anonymous function (MATLAB) of two variables. The basis functions describe a parameterized gain G(α,V)=G0+G1αN+G2VN+G3αNVN where αN and VN are the normalized scheduling variables (see the Normalization property of K). polyBasis — Power series expansion and Chebyshev expansion. fourierBasis — Periodic Fourier series expansion. The basis functions generated by fourierBasis are periodic such that a gain surface K defined by those functions satisfies K(–1) = K(1). When you create a gain surface using tunableSurface, the software normalizes the scheduling-variable range that you specify with domain to the interval [–1,1]. Therefore, if you use periodic basis functions, then the sampled range of the corresponding scheduling variable must be exactly one period. This restriction ensures that the periodicity of the basis function matches that of the scheduling variable. For example, if the periodically varying scheduling variable is an angle that ranges from 0 to 2π, then the corresponding values in domain must also range from 0 to 2π. ndBasis — Build multidimensional expansions from lower-dimensional expansions. This function is useful when you want to use different basis functions for different scheduling variables. See the reference pages for those functions for more information about the basis functions they generate. BasisFunctions — Basis functions, specified as a function handle. When you create the gain surface, the shapefcn input argument sets the initial value of this property. Coefficients — Tunable coefficients of the gain surface, specified as an array-valued realp tunable parameter. The dimensions of K0init and the number of basis functions in shapefcn determine the dimensions of K.Coefficients. For scalar gains, K.Coefficients has dimensions [1,M+1], where M is the number of basis functions. The entries in K.Coefficients correspond to the tunable coefficients K0,...,KM. For array-valued gains, each coefficient expands to the dimension of K0init. These expanded coefficients are concatenated horizontally in K.Coefficients. Therefore, for example, for a two-input, two-output gain surface, K.Coefficients has dimensions [2,2(M+1)]. SamplingGrid — Grid of design points, specified as a data structure. When you create the gain surface, the domain input argument sets the initial value of this property. InputOffset — Vector of offsets for each scheduling variable. InputScaling — Vector of scaling factors for each scheduling variable. OutputScaling — Scaling factor for overall gain. tunableSurface normalizes the scheduling variables to compress their numerical range and improve the numerical stability of the optimization process. By default, OutputScaling = 1, and tunableSurface computes values for InputOffset and InputScaling that map the SamplingGrid domain of each scheduling variable to [–1,1]. Thus, n = 0 at the center of the design-point range. If you have a known gain value for a particular design point, you can set Normalization.InputOffset so that n = 0 at that design point. You can then set K0init to the known gain value. If you want to restrict a scheduling variable to nonnegative values, set Normalization.InputOffset to the minimum value of that variable in your design grid. This restriction is useful, for example, when your basis function includes σ. Name — Name of the gain surface, specified as a character vector. When you create the gain surface, the name input argument sets the initial value of this property. To tune a gain surface in a control system modeled in MATLAB®: Connect the gain surface with an array of plant models corresponding to the design points in domain. For example, suppose G is such an array, and K represents a variable integration time. The following command builds a closed-loop model that you can tune with the systune command. 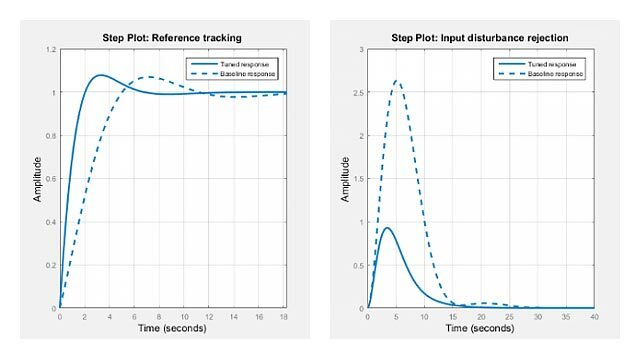 To tune a gain surface in a control system modeled in Simulink: Use the gain surface to parameterize a lookup-table, matrix interpolation, or MATLAB function block in the Simulink model. For example, suppose ST0 is an slTuner interface to a Simulink model, and GainTable is the name of a tuned block in the interface. The following command sets the parameterization of GainTable to the tunable gain surface. See Parameterize Gain Schedules for more information. When you use writeBlockValue to write a tuned gain surface back to a Simulink model, the software uses codegen to generate MATLAB code for the gain surface. You can use codegen yourself to examine this code.